This past weekend was host to the tenth annual International Lindy Hop Championships. It is one of my more eccentric fascinations, to the point where viewing some of its events has shaped up as a personal tradition over the past several years. Here’s some footage of what is always my most-sought portion of the events, the solo jazz/Charleston finals. To whoever may have influence in the anime industry, please please please base your next dancing competition series on this stuff. Words cannot express the dedication with which I’d view it. On its face, there is no reason for this as-of-late tradition to make any sense. I am not a good dancer whatsoever, and am much less of an expert on dances, which is particularly true when it concerns the earlier-1900's jazz and swing eras. This makes me quite possibly the most ill-equipped person for parsing out anything having to do with a whole competition dedicated to high-level ol’ timey dance. Hell, it should theoretically be impossible for me to even hear about something like this! The International Lindy Hop Championships is practically a niche of a niche, in a field with which I am completely out of my depth. Yet somehow, it happened, and this event where everyone dresses in their best La La Land cosplay and dances like it’s the Roaring Twenties has remained a small yet solid fixture in my life. Despite knowing very little of it and being no practitioner of it, I’ve always been drawn to dance. The root of that, as is true of many things concerning little old Justin, arguably traces back to video games. I had first gotten into dance music as a kid, but that did not automatically translate to getting into the act of dance. That would happen when my brother and I were introduced to Dance Dance Revolution. We originally knew of it from utterly sucking at it throughout various arcades—the game of those days was Extreme—but it finally sunk its hooks into us once our parents got DDRMAX2 for the Playstation 2. From what I remember, it had been featured on the Today show on NBC, and they got it as a sort of exercise tool for themselves. What happened instead was Chris and I completely and utterly latching onto it. Ours was a strength of dedication that led us to first getting a pair of Red Octane’s foam dance pads, then even graduating to honest-to-god metal pads, complete with back bars. At our peak, we were reliably racking up A’s and AA’s on 9-footer songs on the Expert/Heavy difficulty. Granted, the very first thing any serious dancer would say in regards to this game series is that DDR bears almost no resemblance to actual dancing. However, it nonetheless established a base-level appreciation for the art. Certainly more than any school PE dance lessons ever did, at the very least. However, though straightforwardly playing DDR may not really be dancing, why be limited to only playing it straight? Such an impulse led to what had to have been the next step in my evolution, freestyle performances. Typically, the performer(s) takes a song, bumps the difficulty down to one of the easier step charts, and then does a choreographed routine around the chart. What it lacks in sheer difficulty, it makes up with showmanship. The fun of DDR freestyles comes from seeing how players can turn the step charts into actual dances, and what flashy antics—spinning, hand or knee presses of arrows, handstands (! )—they can pull of in the meantime. I totally adored seeing these things, and to this day, they still make me want to add in stupid bits of quote-unquote “flair” when playing songs on the easier difficulties. My favorite one, funnily enough, is actually based on the Expert chart of a song rather than the Light version. The footwork that J. Dogg does to “AM-3P” is downright mesmerizing, especially with the awareness of how the Expert chart goes. Ever since exposure to that, I have always had short-term bouts where I would be extremely into seeing videos of certain types of dancing. Often, it dovetailed with my longtime fandom of dance music, which would lead to such moments as being into jumpstyle and hardstyle videos. The exact same tendency—no kidding—was what led me to pick up an interest in performances of the Charleston. I had heard of the Charleston, and knew that it was an old dance that came about during jazz’s heyday, but for the longest time, I had never seen it in action, and did not really have an inclination to seek it out. However, one thing that I did have some interest in was the early-90's dance music classic “Coffee Pot (It’s Time for the Percolator)” by Cajmere, a song with special personal significance, being first exposed to during my days as a math tutor for my college’s Educational Opportunity Fund (EOF) incoming-freshman summer program. One fateful day, I wanted to see videos of people dancing to it. So I put in “cajmere percolator dance” as YouTube search criteria, and on the first page, I saw this black-and-white video promising some “Original Old School Perculator.” I was intrigued. It’s a very simple conceit—old footage of dancing set to the Cajmere track—but it was enthralling. I had to know, what were they doing?! 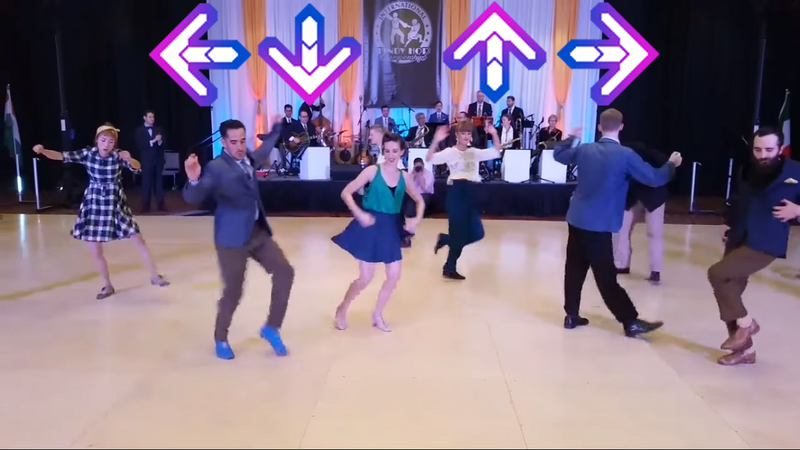 A glance at the comments revealed that the dance in question was the Charleston. Naturally, now being wiser about it all, the next step was to bask in the glory of more footage. That then brought me to the Solo Charleston finals from the 2013 International Lindy Hop Championships, one of the first-page results from simply looking up “charleston” or “charleston dance” on YouTube. I could not get enough of the combination of off-the-wall technique and physical comedy on display. Thus, I subscribed to the YouTube channel for the competition. Profoundly stupid though the road may have been, that is how I got here today.